I have a 2006 MCS Convertible with 60K miles and numerous Dinan intake, exhaust, and software upgrades. The knock sensor is setting off the SES light intermittently under normal driving situations. I've read that the sensors can go bad and that it is a fair job to get to it and replace it. I've also read to have the supercharger serviced while it is apart. Any ideas or suggestions? Thanks. I believe the knock sensor on your R52 is located on the front of the engine behind the intake manifold. I'd check to make sure the connection is good on the sensor before attempting to replace as it definitely can be a process. Read over the really good advice in this thread HERE. 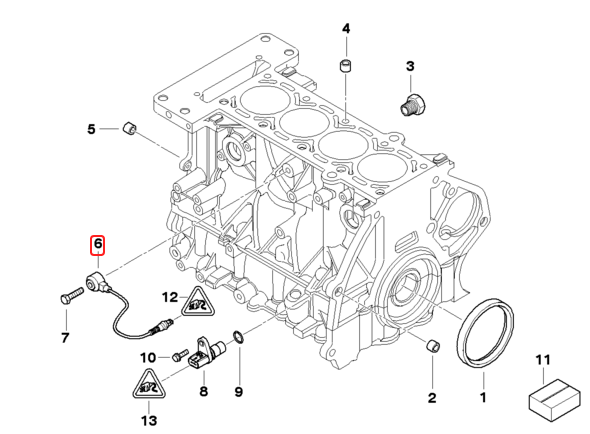 Sensor HERE if needed and as recommended intake gasket HERE. Let me know if you have any questions. Great info, thanks! Sounds like the first order of business is to check the connection for the knock sensor, and then plan to replace it if the faults continue. Do you agree that taking the opportunity when the car is apart to change the supercharger fluid and probably the engine oil is a good combination? I had someone point out that with intermittent faults the car will not pass smog in California so I will need to get it fixed and drive it for a while before my next smog at time of registration. That said, having a sensor fail is still better than actual knocking and engine failure. When we do it we leave the intake manifold in place and take the supercharger loose. There is no way to get that bolt out without the Supercharger being loose. Just make sure you torque the sensor bolt when you put it back in, and index the wire back in the same direction it came off. Otherwise, what most people do is remove the front bumper, intake manifold, and loosen the supercharger. If you go this route it may be a good idea to replace a few things while you're in there. We have supercharger fluid HERE. Let me know if you have any questions. Which iPod adapter works in 2006 MCS w/ HK audio?